There are several other types of articulated axes bearing leaves arranged in nodal whorls for which affinities with the Sphenophyllales have been suggested. One is Gondwanophyton from the Early Permian of India and Australia (Maithy, 1974; Srivastava and Rigby, 1983; McLoughlin, 1992), a plant characterized by slender, articulated striate stems and narrow cuneate, semicircular to reniform leaves arranged in nodal whorls or pairs (FIG. 10.18). Leaf venation is dichotomous and similar to Sphenophyllum. As the reproductive structures of Gondwanophyton remain unknown, however, the systematic affinities of this taxon continue to be elusive. 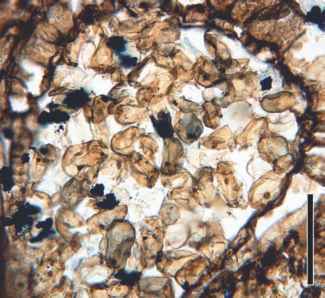 Peltastrobus is a cone type that produced monolete spores (FIGS. 10.19, 10.20) and is thought to be associated with the Sphenophyllales (Baxter, 1950). Peltastrobus reedae is known from Upper and Middle Pennsylvanian deposits and includes cones ~4mm in diameter (Leisman and Graves, 1964). 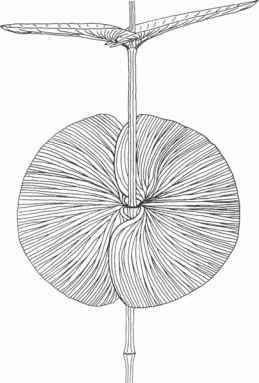 Whorls consist of three sterile and three fertile bracts at each node (FIG. 10.21). Vegetative and sterile bracts alternate. Each fertile unit consists of a bract that subtends a cluster of five axillary sporangiophores. Two sporangiophores are directed upward and two downward. The remaining sporangiophore extends outward at 90° from the cone axis. 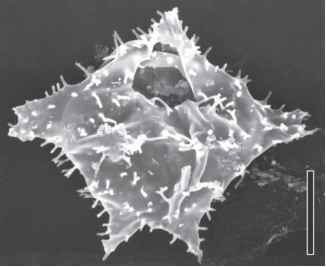 Each sporangiophore bears up to eight sporangia arranged in an inner and an outer whorl (FIG. 10.22). The epidermal cells on the sporangiophores have thin walls with sinuous margins. 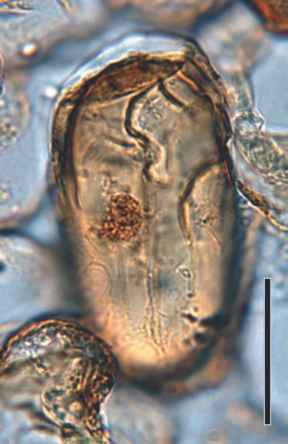 figure 10.19 Peltastrobus reedae sporangium with monolete spores (Pennsylvanian). Bar = 80 pm. figure 10.20 Peltastrobus reedae spore. Note the opaque spherical structure inside the spore (Pennsylvanian). Bar = 20 pm.